Triticale flour is a hybrid of wheat and rye with higher protein and lysine content than many other cereal grains. Triticale is a hybrid of wheat and rye. It is obtained from finely grinding triticale grain. When cross-bred in the 19th century, triticale combines the high yield potential of wheat with the disease and environmental tolerance of rye. The primary producers are Australia, Belarus, Germany, France and Poland. There is a small amount produced in the USA. Triticale flour has a higher protein and lysine content than many other cereal grains. Triticale flour could be used as the only flour or wheat-rye variety breads. In traditional pan breads,it can replace a portion of the wheat flour. It has low gluten content so it can be used in the production of layer cakes, although additional flavors may be needed to mask its nuttier flavor profile. Triticale flour contains protein 13.8% (can range from 10-15%), carbohydrate 73%, fiber 14.6%, moisture 10%, fat 11.8%, ash 1.4-2.9%. Triticale flour will handle better than rye flour, but not as well as wheat flour for bread products. The gluten quality and quantity is lower, thus resulting in smaller bread volumes. In traditional pan breads, substitute up to 40% triticale flour for wheat flour, reduce mixing and proofing times. Protein and lysine contents of triticale flour are higher as compared to wheat flour. 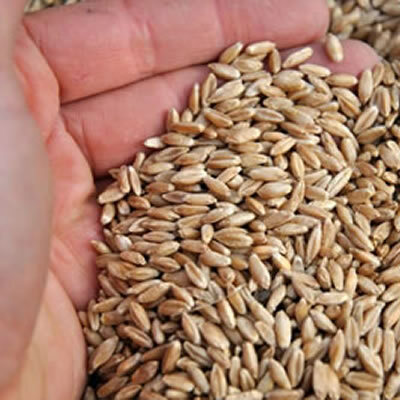 Lysine content is 2.7-4.4% of total protein as compared to wheat (2.1-2.5% lysine content). Protein content is 10.7-16.3% as compared to wheat (11.5-12.0%).2 It is also a good source of thiamine, magnesium and folate. Pérez, Gabriela T., Alberto E. LeóN, Pablo D. Ribotta, Alicia Aguirre, Oscar J. Rubiolo, and María C. AñóN. “Use of Triticale Flours in Cracker-making.” European Food Research and Technology 217.2 (2003): 134-37. Juneja, P. K., B. L. Kawatra, and S. Bajaj. “NUTRITIVE VALUE OF TRITICALE AND THE EFFECTS OF ITS SUPPLEMENTATION TO WHEAT AND BENGAL GRAM (Cicer Arietinum) FLOUR.” Journal of Food Science 45.2 (1980): 328-30. .
Center for Food Safety and Applied Nutrition. “Search for FDA Guidance Documents – Guidance for Industry: Gluten-Free Labeling of Foods; Small Entity Compliance Guide.” U S Food and Drug Administration Home Page. 1 July 2016. https://www.fda.gov/RegulatoryInformation/Guidances/ucm402549.htm. Accessed 21 June 2017.